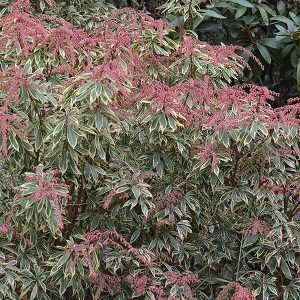 For something a little different in the garden the variegated forms of Pieris japonica are well worth considering. A few variegated forms of Piers are available, and they are excellent for adding a little life in darker areas of the garden. The foliage is generally a lither green with leaf margins cream to white. The same bell shaped flowers in spring, and once established, very easy care. They are excellent when planted on the sunny side of Rhododendrons and Camellias and can be used as a background plant for Hostas and Epimediums. Maybe simply plant hem near the front of the border where the foliage and flowers in spring add year round interest. These variegated forms are excellent for growing in containers in courtyards where they provide a lift in a shaded position. Or grow them in the garden between darker foliaged plants to provide contrast. Like all Piers they do like a slightly acidic soil, so you can use a Camellia and Azalea fertiliser. Good drainage and some moisture through summer should be all the care that they require. P. japonica ‘Variegata’ – A small growing form with white flowers. P. japonica ‘Gold Rim’ – Mid olive green foliage, pink when young and then the deeper green flushed with pale golden yellow to cream on the leaf margins. Also known as ‘White Rim’. P. japonica Little Heath – Very slow growing and excellent in containers, small leaves margined with a creamy white.